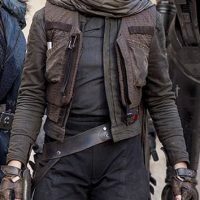 Jyn Erso was a human female soldier and former criminal who fought for the Alliance to Restore the Republic as a sergeant during the Galactic Civil War. She was recruited by Mon Mothma, a leader of the Rebel Alliance, to take part in what became the theft of the Death Star plans. Dark slate or bluish grey with yoke collar and 3/4 length sleeves. The collar is high in back and flaps open, with the “top” flap being the left side flap (point of flap on the right). The flap is squared at the center front. a. Pants are faded black (black, dark grey, or very dark blue accepted) cotton/denim with a wide high-waisted waistband with tab. Tab should line up with center front seam on the right leg. Pants have center front and back seams on each leg, in addition to the inseam and outer leg seam. Pants reach just to the tops of the boots. b. Just below the knee is a grey/white/cream horizontal strap in a casing made of the same fabric as the pants. The strap is only visible outside the casing on the outside of each leg and has a black military style slide buckle and two tan/gray printed, embroidered, or suede rectangles on the front edge of the casing. c. Below the strap and casing are at least 8 vertical pin-tucks on the outside front quarter of the leg that narrow at the ankle. d. No visible pockets allowed. a. Medium brown color, padded vest. Vest has two front pockets with three lines of decorative top-stitching. Vest front is topstitched with horizontal stitches approximately 3/8” to 1/2” (95 mm – 125 mm) apart and two vertical hand-stitched lines on each side. Stitching may be brown, ivory/cream, and/or yellow. Short stand up collar with topstitching at back of neck. Vest length comes to somewhere within the high-waisted waistband of the pants. b. Back is quilted with rows of squares and narrower rectangles. Quilting should not touch the side seams of the vest and should extend from the waistband to roughly half way up the arm hole. Back of vest may be made of a different, thinner fabric than the front, but must be roughly the same color as the front. c. Front of vest has two horizontal brown strips of webbing on either side of the chest above the pockets that are stitched down on the sides and in the center of each strip. d. There are vertical strips of brown webbing on the insides and outsides of the front center edges of the vest with lengths of black 4-ribbed tubing/wiring attached. The outside right webbing strip has a screen-accurate hook at the top. The outside right side, inside right, and inside left have wire/tubing anchored near the top and bottom of the webbing strips. The outside left side wire/tubing is attached at the top and hangs down beyond the bottom of the webbing with a rounded black piece on the end. e. There is a rectangular horizontal flap attached between the left pocket and left webbing strip. Flap is made of the same fabric as the front of the vest. f. There is a card device is attached to the left side of the waistband. Card device is silver/gray with a red rectangular button. g. Lining is red with facing that is made of the same material as the front of the vest and has the same top stitching. h. Waistband is ruched with similar top stitching as front of vest. Waistband should be roughly 2.5″-3″ (6 cm – 7 cm) wide. Right side of waistband has two dark colored rectangular buckles/hooks. i. Recommended: Vest has darker brown rectangular patch under the arm. a. Plain dark brown combat boots with two matching leather flaps covering the laces. (Frye brand “Veronica Combat Boots” or similar.) Top flap is held closed with hidden fasteners. Bottom flap is cut out on the outside corners. Both flaps have top-stitching around the edges. b. Bottom flap of boot has screen-accurate buckle. The buckle’s bail (wire piece) is attached with a loop of leather sewn into the flap. The ‘box’ parts of the buckle are black and the ‘wire’ parts are silver. c. Boots may have discrete inner zipper. a. Brown finger-less gloves similar to the Black Diamond ‘Stone’ gloves, with the strap altered to remove the logo and replace the Velcro with a snap. Gloves have been weathered darker than the original tan. b. Straps should be roughly 1″ (2.5 cm) wide and be secured with snaps. Straps have the finger-side corner cut off. c. Both gloves have a circular detail added to the back of the hand. The left is stitching only. The right has the circle cut out and replaced by two differently toned half circles of darker leather. a. Weathered black/brown leather with 4 rivets/snaps at left front and left back. Belt opens at left hip with overlapping leather for the closure. b. Belt has a fitted holster with leg strap at the right hip that closes with snaps. There are 3 stud/post portion of the snaps and a single cap/socket. The leg strap also has a keeper loop. The holster has a retention strap for the blaster. Long bangs (between cheek bone and shoulder length) parted in the middle with layers framing the face. Back of hair is gathered into a small bun at the nape of the neck. If a wig or extensions are used, they must be high quality and appear like real hair. BlasTech A-180 blaster (Rogue One: A Star Wars Story version), unless local laws prohibit or strongly discourage carrying anything that looks like a firearm. b. Comlink: a larger more detailed cylinder with a longer silver clip. Black body with silver ends. a. Dull sage green, blue-green, or teal-gray heavy cotton jacket. Jacket is visible below the bottom of the vest but does not reach past top of hips. Sleeves reach just to the wrist and do not cover the gloves. b. Jacket has tan/cream/yellow printed, suede, or embroidered bar detail on the sleeves. c. Jacket has a mandarin collar. Long dark grey scarf with brown, purple, or blue undertones. Scarf is angled at the ends. Scarf is long enough that both ends reach approximately to the knees when worn looped once around the neck. A clear crystal on a leather cord. b. If tonfa baton is present, the belt should have a clip to hang the baton behind the holster.